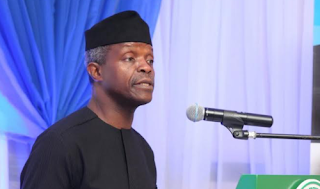 Acting President Yemi Osinbajo says the presidency is not in the know of the siege laid to the national assembly by operatives of the Department of State Services (DSS). For over seven hours on Tuesday, lawmakers were denied entrance to the national assembly complex by arms bearing DSS operatives. In a statement signed by Laolu Akande, media aide to the acting president, Osinbajo said those who participated in the “travesty” would be identified and “subjected to appropriate disciplinary action”. “The unlawful act which was done without the knowledge of the presidency is condemnable and completely unacceptable,” the statement read. “Acting President Yemi Osinbajo, SAN, has described the unauthorised takeover of the national assembly complex earlier today as a gross violation of constitutional order, rule of law and all accepted notions of law and order. The acting president had fired Lawan Daura , director-general of DSS, but the reason for Daura’s sack was not stated. Meanwhile, Ibrahim Idris, inspector-general of police, has said his men were not involved in the siege on the national assembly. Speaking to state house correspondents after honouring the invitation of Osinbajo, Idris said he was yet to be briefed about the incident.